President Recep Tayyip Erdoğan attended the NATO leaders’ summit on July 11 as the first executive president of Turkey in the Belgian capital Brussels, as the alliance vowed to protect its southern border against threats. 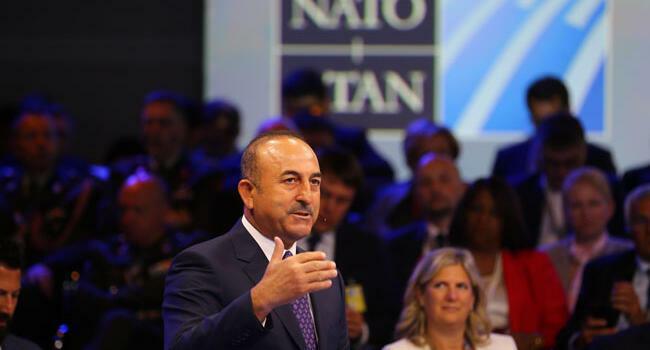 The summit statement also reiterated that NATO is in strong cooperation with Turkey against terror. "... tailored assurance measures for Turkey to respond to the growing security challenges from the south contribute to the security of the Alliance as a whole, and will be fully implemented," said the summit declaration. “Syria has a significant inventory of short range ballistic missiles whose range covers part of NATO’s territory and some of our partners’ territories,” said the declaration noting that the alliance remains concerned that Turkey has been hit three times in the last four years by missiles launched from Syria. “We continue to monitor and assess the ballistic missile threat from Syria.The increasing threat posed by the proliferation of ballistic missiles in the vicinity of the south-east border of the Alliance has been, and remains a driver in NATO’s development and deployment of a ballistic missile defence system, which is configured to counter threats from outside the Euro-Atlantic area,” said the alliance. Erdoğan, accompanied by Foreign Minister Mevlüt Çavuşoğlu and new Defense Minister Hulusi Akar, was greeted by NATO Secretary-General Jens Stoltenberg at the new building of the NATO headquarters. On the sidelines of the summit, the president met with German Chancellor Angela Merkel late July 11, but scheduled meeting with British Prime Minister Theresa May was cancelled. The Turkish president will also meet with Italian Prime Minister Giuseppe Conte, French President Emmanuel Macron, Ukrainian President Petro Poroshenko, Bulgarian President Rumen Radev, Afghan President Ashraf Ghani and Greek Prime Minister Alexis Tsipras on July 12. First lady Emine Erdoğan is accompanying him on the trip. The first ladies visited a music academy and attended a piano and violin concert. Erdoğan had a chat with his U.S. counterpart Donald Trump ahead of a leaders’ photo shoot on July 11. Some 26 military helicopters, including Turkish-Italian-made Atak helicopters, from 23 countries performed a fly-past after the photo shoot of the leaders. Erdoğan’s participation at the NATO summit comes at a time when Turkish-Russian relations have strengthened politically and economically. NATO is uneasy over Ankara’s decision to purchase Russian S-400 missile systems, which the alliance has warned could compromise its own. As U.S. President Donald Trump lobbied allies at a NATO summit to spend more money on defence ,he urged the Atlantic allies to boost defence spending to four percent of their countries' GDP, his spokeswoman said. The figure is twice what the allies have already pledged to reach by 2024. “He suggested that countries not only meet their commitment of two percent of the GDP on defence spending, but that they increase it to four percent," Sarah Sanders said. In a clear nod to criticism by Trump that NATO partners were spending too little on defence, the military alliance said in a summit statement: "We are committed to improving the balance of sharing the costs and responsibilities of alliance membership." NATO allies voiced concerns over Russia's recent activities, saying they had reduced stability and security and said they "stand in solidarity" with British assessment that Russia was to blame for a nerve agent attack in the British city of Salisbury. NATO leaders have formally invited Macedonia to start membership talks with the alliance, while cautioning that it can't be completed until the name issue is resolved.Macedonia and Greece last month signed a deal in which Macedonia will change its name to North Macedonia. In exchange, Athens has unblocked efforts by its northern neighbor to join both NATO and the European Union.